Participation in formal swim lessons has been associated with an 88% reduction in the risk of drowning in young children. As you are no doubt aware, teaching swimming to individuals with Autism Spectrum Disorder (ASD) can be difficult and requires specialist training, procedures, resources and support. Finding a qualified swimming instructor with these skills is not always easy! Autism Swim is here to help. We offer training, resources and support to swim instructors and swim centres, so that they are better geared to teach your son/daughter swimming and water safety. Our AS-Approved instructors learn about relevant areas such as sensory challenges, behaviours of concern, and communication methodologies (to name a few) and they receive targeted resources from us on a monthly basis. Our job is to assist swimming teachers/centres to facilitate stronger outcomes for their swimmers with ASD/cognitive deficit. Unfortunately, drowning is among the leading causes of death in individuals with ASD. Our aim is to lower the drowning statistics, ensuring inclusive services for all, in a fun and supportive environment. Where’s the closest AS-Approved centre or instructor to you? To find your closest Autism Swim Approved Instructor or Centre, click here to view our locations map (simply click on your area or type your postcode into the box). If you can’t see a centre or instructor near you, there is a link on the page which prompts you to enter your closest swim centres. We will then make contact with them to see if they’re interested and suitable in becoming Autism Swim Approved. The most success in instructors/centres becoming certified occurs when parents introduce our services to their local swim centre. That way, they know that parents are looking for this specialised service. Here’s a brochure that you can download and give to the swim centre or instructor which contains additional information. How can else can we help? 1. The most proactive thing you can do as a parent is equip yourself with our Wandering and Drowning Prevention Toolkit. The first and only kind in the world. Many parents don’t realise that their child would be considered ‘high risk’ and have never received any expert advice on this. Through Autism Swim you have an opportunity to learn from clinicians who specialise in these areas. 2. We have a range of free blogs which may be of interest to you. 3. Engage one of our Clinicians. Autism Swim has a Clinical team of Wandering and Drowning Prevention Specialists, ready to help you with the individual needs of your little one. Want to engage one of our Clinicians? Click here to contact us. What do people say about Autism Swim? The factual information I gathered during the course will be easy to apply to clients with Autism. I highly recommend attending this course if an opportunity arises"
“Words cannot express how fantastic this program has been for our family. Thank you for turning this into a dream come true experience and for all your efforts in teaching water safety, confidence and strength to these beautiful human beings living with ASD. “The training course I attended was fantastic. You made me understand Autism in a whole new way. “We are absolutely loving this program for our kids. Most special needs programs set limits on these amazing kids and assume everything needs to be simplified. What does it mean when an instructor is Autism Swim Approved? This means that the centre or the instructor has undertaken our initial training and now receives resources and support from us to more effectively teach your little swimmer. Are Autism Swim Approved lessons covered by the NDIS? It is up to the Autism Swim Approved Centre/Instructor as to whether they choose to register as a provider or not. In our locations tab, each centre or instructor has indicated if they currently are, or plan to become registered as a provider. 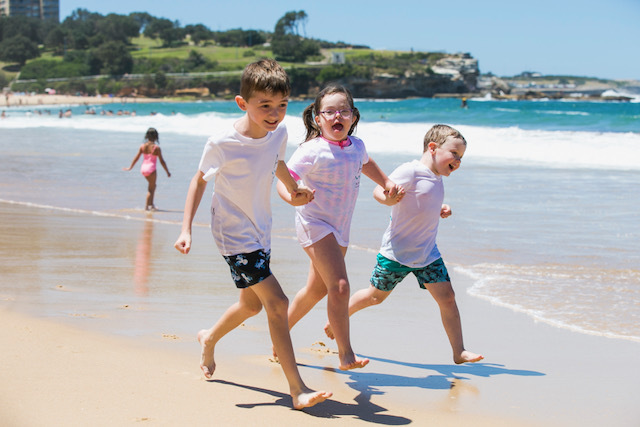 For more information on swimming and the NDIS, please click here.